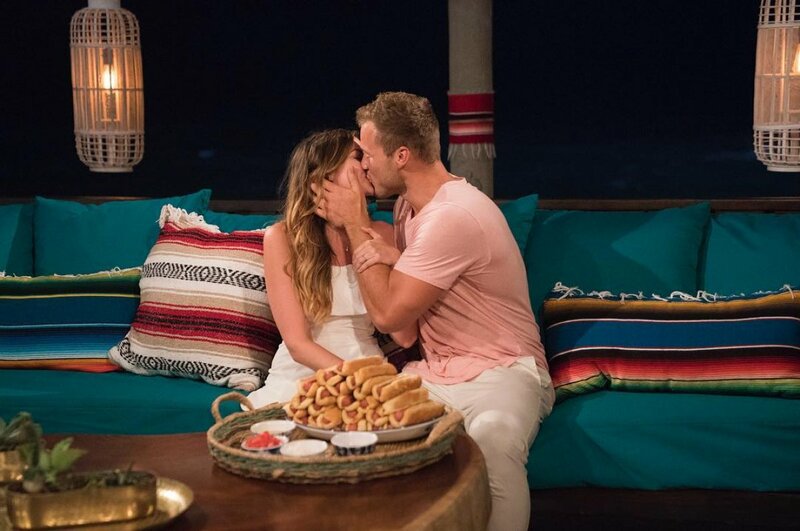 Bachelor in Paradise spoilers reveal the remainder of Season 5 -- including what happens to Tia Booth and Colton Underwood, Astrid Loch and Kevin Wendt, Krystal Nielson and Chris Randone, Jenna Cooper and Jordan Kimball, and the rest of the couples; and which bachelors and bachelorettes continue dating, break-up, or get engaged in the finale. [Bachelor in Paradise Spoilers Warning: Stop reading immediately if you do not want to find out which Bachelor in Paradise couples stay together or break up, who is still together now, and whether Season 5's finale ends with any bachelor and bachelorette engagements besides Jared Haibon and Ashley Iaconetti]. Bachelor in Paradise's next episode airs on Monday night, and it will be a three-hour televised broadcast that will be sure to shock fans and tug at the heartstrings. Another episode follows on September 4, and Chris Harrison has teased the week will be a "jaw-dropping" event. In addition to Tia, Colton, Astrid, Kevin, Krystal, Chris, Jenna, and Jordan, Bachelor in Paradise's current cast members are Kendall Long, Joe Amabile, John Graham, Olivia Goethals, Cassandra Ferguson, Angela Amezcua, Eric Bigger, Chelsea Roy, Annaliese Puccini, and Kamil Nicalek. Astrid and Kevin have been together for most of the season, and they are both completely smitten with each other. Kevin has fears and concerns about dating someone in Bachelor Nation once they return home due to his failed romances from The Bachelorette and The Bachelor Winter Games, but he's willing to put his heart on the line for Astrid. In turn, Astrid considers Kevin her boyfriend, and she only has eyes for him. According to Reality Steve spoiler blogger Steve Carbone, Kevin and Astrid choose to split before the round of overnight Fantasy Suite dates; however, they reconciled in the real world. Kevin and Astrid are now dating without cameras rolling, according to Carbone, and things are going well. Krystal and Chris got involved with each other in the form of a betrayal to another cast member, as Chris had kissed Krystal after promising Tia he was "all in" their relationship. Once Tia broke things off with Chris for good, he invested himself in his romance with Krystal, and it didn't take long for the couple to commit to each other. Krystal has faced temptation in Paradise, like when Connor Obrochta entered the picture, but she decided to see things through with Chris. Carbone reports that Krystal and Chris make it to the Final Rose Ceremony and will choose to embark on a Fantasy Suite together -- something that's a big deal considering Chris Harrison informs the cast members to only remain on the show if they are serious about their relationships. And in a surprise twist, Chris will propose marriage to Krystal in Paradise! Carbone reported this spoiler in August, although he wasn't sure about the status of their relationship when he posted his first set of spoilers in July. Tia and Colton are officially boyfriend and girlfriend on Bachelor in Paradise's fifth season right now. Although Colton was hesitant at first because he needed closure from his failed romance with Becca Kufrin, Colton decided to give his feelings for Tia an honest shot. The couple then became an item in Mexico, rejecting dates from newcomers. However, Tia and Colton's relationship will apparently come crashing down on Monday night. Previous have shown the couple bawling their eyes out during an emotional conversation. "I guess Colton didn't see themselves lasting in the real world so they broke up and both went home," Carbone says. Annaliese and Kamil have been shown getting to know each other after a romantic date. Annaliese has been thrilled about her man considering she couldn't hang on to relationships with Jordan and Kenny Layne. Annaliese and Kamil will reportedly make it to the end of the season together and enjoy a Fantasy Suite date. But Carbone claims Kamil broke up with Annaliese onstage when Bachelor in Paradise's reunion special filmed on August 28. The crowd allegedly turned against Kamil when fans watched him break her heart. Chelsea has been in Paradise since the start of the season, but she has yet to develop an intense connection with someone. Things didn't work out with David Ravitz, and she cried when newcomers passed on dates with her. However, when the women had the power, she gave her coveted rose to John, which sent multiple bachelors packing -- including Connor and Benoit Beausejour-Savard. John and Chelsea started to hit it off until Olivia came into the picture and asked John out. Olivia will reportedly give her final rose to John, and then the couple will decide to enjoy a Fantasy Suite together. According to Carbone, Olivia and John are still dating in the real world and making things work. As for Chelsea, she reportedly doesn't make it to the Final Rose Ceremony, but once she returned home, she sparked a romance with Nick Spetsas, who showed interest in the bachelorette very early on but was eliminated during the season's fifth Rose Ceremony. Eric has landed himself in some hot water on Bachelor in Paradise by accepting a date from Cassandra when he promised to be fully committed to his original love interest, Angela, in Paradise. Whether Eric changed his mind about Angela or simply found himself incredibly attracted to Cassandra, his decision to accept a date with Cassandra sent shock waves through Paradise and put all of the ladies on alert. Eric allegedly has an emotional meltdown after trying to juggle both ladies and decide between them, so he chooses to go home at the cocktail party preceding the Final Rose Ceremony. Surprisingly, however, Angela was spotted with Connor on the 4th of July in St. Petersburg, FL. Carbone reports they may be a couple now, which is interesting considering they didn't even date in Paradise. Kendall and Joe have been going strong in Paradise ever since Leo quit the show and left the equation. At the cocktail party preceding the season's Final Rose Ceremony, Kendall and Joe will reportedly break up, although they will have been together for most of the season. Kendall and Joe's relationship, however, doesn't seem to be over. Not only did Kendall visit Joe in Chicago a few weeks ago, but social media indicates Joe also spent an early August weekend in Los Angeles, CA with her. While in Los Angeles, Kendall and Joe attended a Dodgers game together, so they are clearly still dating and there must be a spark! Now what about Jenna and Jordan? As shown on Bachelor in Paradise, Jenna has finally decided to stop seeing other guys and take her deep feelings for the professional model seriously. Not only will the couple make it all the way to the end of Season 5 and get to know each other better in the Fantasy Suite, but Carbone reports they get engaged! That's right, Jordan and Jenna are reportedly currently engaged! According to Carbone, there are still more bachelors and bachelorettes to arrive in Paradise -- Shushanna Mkrtychyan from Ben Higgins' season of The Bachelor, Christen Whitney from Nick Viall's The Bachelor edition, Robby Hayes from JoJo Fletcher's season of The Bachelorette, Diggy Moreland from Rachel Lindsay's season of The Bachelorette, and Jordan Mauger, the former The Bachelor: New Zealand star who competed on The Bachelor Winter Games. In the next episode, Eric will take Cassandra out on her date, and then Colton will dump and devastate Tia. Two female newcomers -- presumably Shushanna and Christen -- will then arrive to the resort and ask out "previously spoken-for guys" on a double date, leaving their ladies to fear the worst back on the beach. This episode will also feature Ashley Iaconetti and Jared Haibon's engagement, which is fitting considering they met on Bachelor in Paradise's second season years ago. Everyone will be thrilled for them, except for Ashley's ex, Kevin, from The Bachelor Winter Games. The men will then hand out the roses. Four women will assume they are going home until Chris Harrison shocks the group with a last-minute arrival from New Zealand, which is obviously Jordan M.
Jordan will have only one hour to decide whom to give his rose to, and so he will suddenly become the most popular man at the cocktail party. But things will begin to fall apart for another couple, as a "conflicted fellow finds himself emotionally drained from saying farewell to his previous love and unable to be the romantic partner that his new interest deserves." This is likely referring to Eric, Angela and Cassandra. And then a confused girl will turn down a date with the man who saved her at the last Rose Ceremony because she can't accept that her first interest in Paradise has chosen to be with somebody else, according to the network. As the rest of the season unfolds, viewers will watch Cassandra get together with Jordan M. and Shushanna date Robby. Skipping ahead to the Final Rose Ceremony, the guys still around will reportedly be Robby, Jordan M., Diggy, John, Kamil, Chris, Kevin, and Jordan K.
As for what happens to Robby and Shushanna, they allegedly decide to leave the show as friends before the Fantasy Suite dates -- and Jordan M. and Cassandra decide to do the same. Carbone reports neither of those two couples reconciled their relationships once they got home.